I just was given this saw which was in a corrugated tin shed since it was first purchased in 1953. It is in very good working order and looks much better with it's speckled original finish since I scrubbed it. There is not a single piece of plastic on it and it is as precise an instrument as I have ever had. My old 12" looks very similar to the 10". Where can I get manual and parts,etc. for it? Thanks for any help. Join in and write your own page! It's easy to do. How? 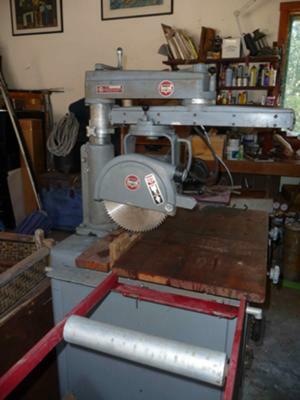 Simply click here to return to Vintage Delta Radial Arm Saw.